It’s official, I’m 26 years old today! So what better way to celebrate than by having a giveaway for all my amazing readers? Not only has it been too long since my last giveaway, but I also wanted to do something in return to thank everyone who’s been reading and supporting my blog these past two years. Whether you’ve been following me since day one or started following me yesterday, THANK YOU! This blog has given me a lot of opportunities I never even dreamed I’d be able to get, allowed me to meet so many amazing and interesting people, some of who are now very good friends of mine, and let me share with others around the world about my passion for beauty. So are you ready for the giveaway? In honor of my birthday, I will be giving away 2 M.A.C lipsticks – one for an international winner and another for a Philippine-based winner. That’s right, I’ll be picking two winners! How’s that sound? Also, this time it’s open INTERNATIONALLY so everyone can join! 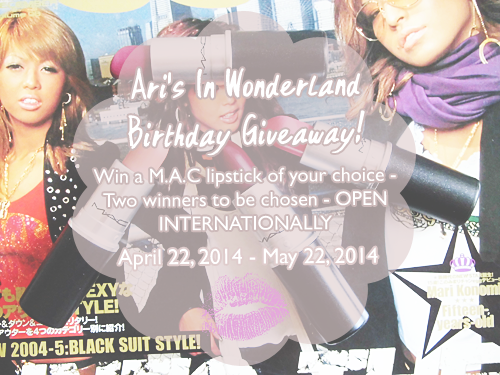 The giveaway is open internationally and will run from April 22, 2014 to May 22, 2014. Winners will be announced on May 30, 2014. If you are under 18 years of age, please make sure to have a parent or guardian’s permission before joining. I will be using a reliable courier to send out the prizes, but once sent I will not be liable for any lost packages. Please check your country’s custom policy as I will not be held responsible for any possible custom charges you will be asked for when claiming your package. Winners, who I will get in contact with upon choosing them, must be willing to provide their full name and home or postal address so I can ship you your prizes, of course! On the day I get all your info, I will ship your prizes exactly one week after. The winners will be announced on my blog’s Facebook page and will also be e-mailed directly so please make sure to provide a valid e-mail address that you can check regularly starting May 30, 2014. If I do not receive a response to my e-mail from either winner after 3 days, a new winner will automatically be chosen. No cheating! I will be checking all entries carefully and if you are caught cheating, you will be immediately disqualified from the giveaway. 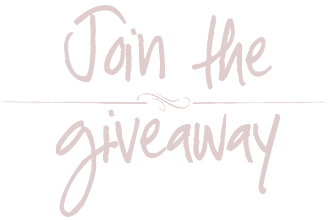 Strictly no giveaway blogs or social media accounts (blogs or accounts created just for joining giveaways)! This will result in an immediate disqualification as well. Participants who follow only to unfollow after the giveaway ends will also be disqualified and maybe even banned from any of my future giveaways. I hope the mechanics aren’t too much or too difficult to follow. They’re just put into place to make sure everyone has a fair chance at winning and that nothing is left unclear! So what are you waiting for? Click the image below to be taken to the 4sponsor widget to join! Good luck!! !